Therefore, the purpose of this study was to determine the SL and water sorption of newly developed ART materials. The study was conducted at the Fluoride and Health Division of the Department of Oral Biology and Genomic Studies of A.B. Shetty Memorial Institute of Dental Sciences, Nitte University, Deralakatte Mangalore, India. 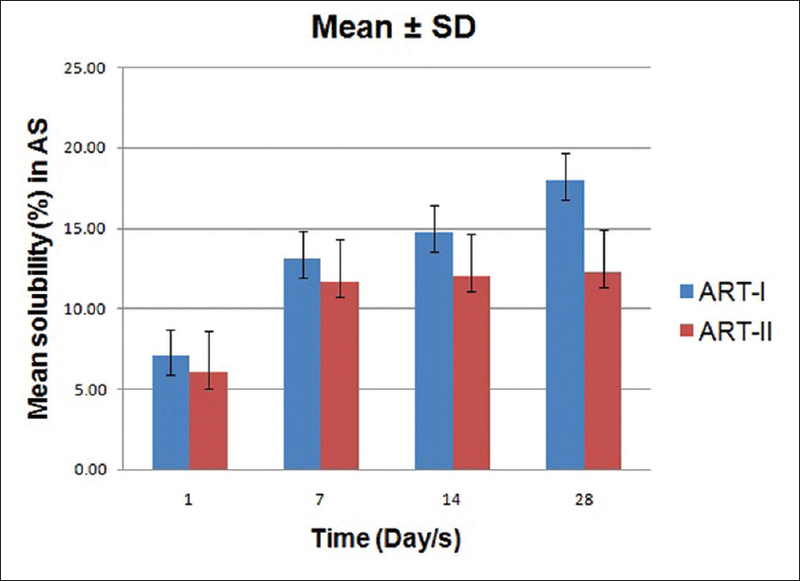 Two novel ART dental cements were assessed for SL and sorption in artificial saliva as well as deionized water. The composition of the artificial saliva employed in these studies was calcium chloride (0.111 g), sodium chloride (2.05 g), sodium acetate (2.05 g), and sodium dihydrogen phosphate (0.156 g) and dissolved in a final volume of 1.00 L of deionized water (final pH value 7.00). Samples of newly developed ART-I (n = 20) and ART-II materials (n = 20) were prepared [Table 1]. Each individual sample incorporated with neem extract was placed in a Teflon mold (with an inner diameter 6 mm and a depth of 3.5 mm) and compressed for 20 min until set. After setting, each specimen was removed from the mold and stored in a closed container at laboratory (ambient) temperature for 24 h, to allow more maturation of the cement. Further, the ART-I and ART-II materials were divided into two sets with ten numbers each to be tested in deionized water and artificial saliva, respectively. Each specimen of the ART-I and ART-II materials was immersed in individual vial containing 7 ml of deionized water (n = 10 of each) and 7 ml of artificial saliva (n = 10 of each ART material). Each storage media was maintained at pH 7.0. The deionized water and artificial saliva were changed during the period of 1, 7, 14, and 28 days. The SL and water sorption were determined by recording the initial weight (W1) of samples using a precision weighing scale (Sartorius BSA223S). Immediately after weighing, samples were then stored in the individual vials containing 7.0 ml of the storage medium (deionized water or artificial saliva) at ambient temperature for time period of 1 day. The specimens were removed from their vials and immediately weighed (W2). Thereafter, the samples were dehydrated at 37°C for a full 24 h and then weighed again (W3). The above-mentioned procedure was repeated at the time interval of 7, 14, and 28 days. The water sorption potential was determined from the difference between the initial and the wet weighing (W2-W1). The loss of material (SL) was obtained from the difference between the initial and final drying weight of each sample (W1-W3). 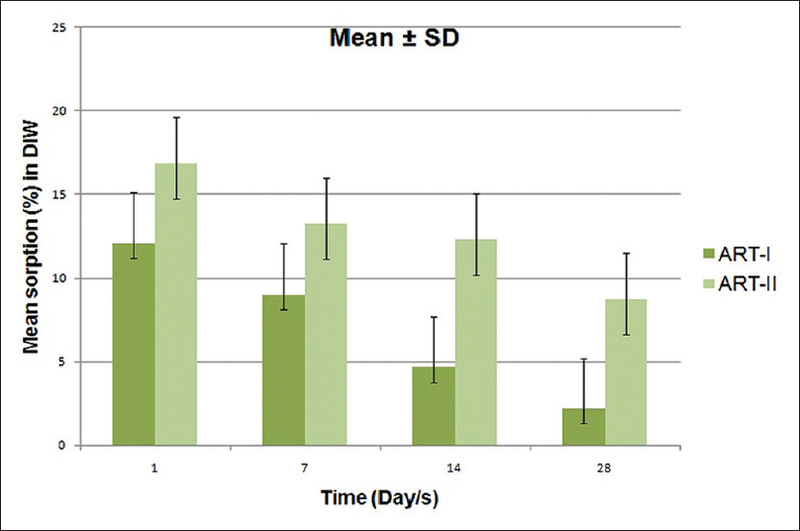 The percentage of mass change or increase in weight of the specimen (S%) is the apparent value for water sorption by the specimen, and the SL% represents the amount of material lost in the media during each immersion period. The water sorption and SL values of the ART materials were analyzed statistically using SPSS version 20 (IBM Corporation, Armonk, New York, United State). Student's t-test was employed to assess the significance level of the differences observed. [Table 2] illustrates the mean water sorption of ART-I and ART-II materials in both storage media in different intervals of time. The water sorption of both ART materials was greater in artificial saliva than it was in deionized water [Figure 1] and [Figure 2]. Water sorption of ART-II was significantly more than that of ART-I in both the media (P < 0.05), except during the first 24 h, when the water sorption in artificial saliva was not significantly different (P ≥ 0.05). The mean water SL of ART-I and ART-II is given in [Table 3]. SL of ART-I and ART-II increased with time [Figure 3] and [Figure 4]. The SL of both ART materials was higher in deionized water, although there were no significant differences in the SL of ART-I and ART-II in deionized water at day 1 of immersion in the storage media (P > 0.05). This study revealed that the SL of the novel ART-I and ART-II materials was found to be within the limits of the American Dental Association Specification after 1 week of immersion in deionized water and artificial saliva. 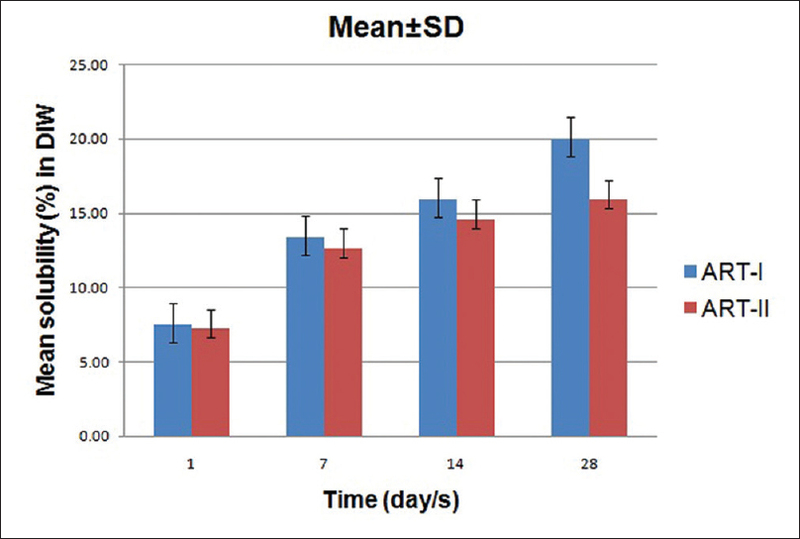 In the present study, two new novel compositions were tested in deionized water and in artificial salivary media during a 1–28-day period. 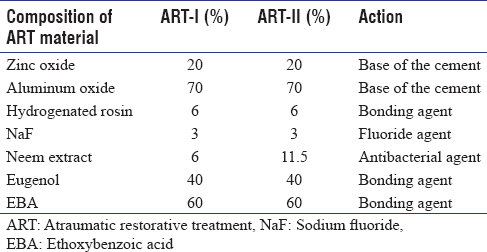 As shown in [Figure 1] and [Figure 2], sorption of ART-I and ART-II materials in artificial saliva was higher than that in deionized water. However, SL of both ART-I and ART-II materials in deionized water was higher than that in artificial saliva [Figure 3] and [Figure 4]. Since water is more diffusible than organic solvents, the loss of material during the 1st day was encouraging, as reported elsewhere., ART-II had higher water sorption and less SL when compared to those of ART-I both in deionized water and artificial saliva media. One of the reasons is mechanical properties of ART-II was higher than that of ART-I (data of mechanical properties of ART materials were not included here). The water sorption measurements actually measured the net gain in weight of a specimen arising from the ingress of water molecules and the egress of monomers and other small molecules. In this study, sorption characteristics of the restorative materials found a difference which needs further evaluation to minimize a confounding issue. It can be concluded that ART-II is more resistant to dissolution than the ART-I material. The SL and water sorption for both novel ART materials were found to be within the range of existing ART dental materials. Statistical analysis was supported by Professor Krishna Bhatt, Department of Statistics of KS Hegde Medical Academy (KSHEMA), Nitte University, Deralakatte, Mangalore, India. Keyf F, Tuna SH, Şen M, Safrany A. Water sorption and solubility of different luting and restorative dental cements. Turk J Med Sci 2007;37:47-55. Pieper CM, Zanchi CH, Rodrigues-Junior SA, Moraes RR, Pontes LS, Bueno M, et al. Sealing ability, water sorption, solubility and toothbrushing abrasion resistance of temporary filling materials. Int Endod J 2009;42:893-9. Cattani-Lorente MA, Dupuis V, Payan J, Moya F, Meyer JM. Effect of water on the physical properties of resin-modified glass ionomer cements. Dent Mater 1999;15:71-8. Musanje L, Shu M, Darvell BW. Water sorption and mechanical behaviour of cosmetic direct restorative materials in artificial saliva. Dent Mater 2001;17:394-401. Malacarne J, Carvalho RM, de Goes MF, Svizero N, Pashley DH, Tay FR, et al. Water sorption/solubility of dental adhesive resins. Dent Mater 2006;22:973-80. Hajmiragha H, Nokar S, Alikhasi M, Nikzad S, Dorriz H. Solubility of three luting cements in dynamic artificial saliva. J Dent (Tehran) 2008;5:95-8. Marghalani HY. Sorption and solubility characteristics of self-adhesive resin cements. Dent Mater 2012;28:e187-98. Musanje L, Darvell BW. Aspects of water sorption from the air, water and artificial saliva in resin composite restorative materials. Dent Mater 2003;19:414-22. Kanchanavasita W, Anstice HM, Pearson GJ. Water sorption characteristics of resin-modified glass-ionomer cements. Biomaterials 1997;18:343-9. Yoshida K, Tanagawa M, Atsuta M. In-vitro solubility of three types of resin and conventional luting cements. J Oral Rehabil 1998;25:285-91. Ghanim A. Water sorption and solubility of different commercially available dental cements. An in vitro study. Med J Babylon 2010;7:1-10. Meşe A, Burrow MF, Tyas MJ. Sorption and solubility of luting cements in different solutions. Dent Mater J 2008;27:702-9. Heshmat H, Banava S, Zarandi P, Faraji F.In vitro Evaluation of water sorption and solubility of G-Cem and Fujicem in water and acid. J Islam Dent Assoc Iran 2013;25:249-54. Yoruc HA, Karaaslan A. Effect of water storage on the mechanical properties of zinc poly carboxylate cements. Dig J Nanomater Biostruct 2007;2:243-52. Kurdi R, Sarkis E, Sarkis N. A comparative study of solubility between resin cement and self-adhesive resin cement. Int Arab J Dent 2013;4: 74-6. Yanikoglu N, Duymus ZY. 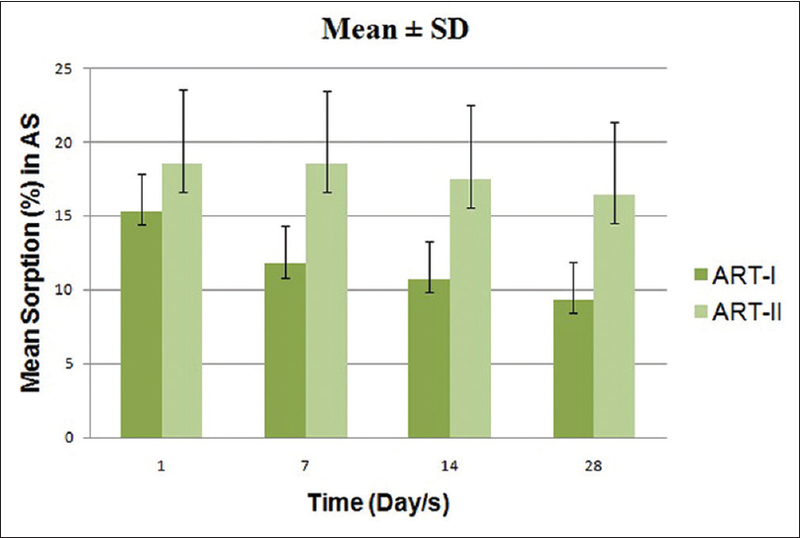 Evaluation of the solubility of dental cements in artificial saliva of different pH values. Dig J Nanomater Biostruct 2007;26:62-7. Heintze SD, Zimmerli B. Relevance of in vitro tests of adhesive and composite dental materials. A review in 3 parts. Part 3:In vitro tests of adhesive systems. Schweiz Monatsschr Zahnmed 2011;121:1024-40. Driscoll CF, Woolsey GD, Reddy TG, Craig RG. Solubility of zinc oxide-eugenol and calcium hydroxide cements in simulated dentinal fluid. J Oral Rehabil 1989;16:451-5.